An arcade game is a specialized coin-operated video game machine, usually comprised of a cabinet, motherboard, monitor, and joystick controls. Each manufacturer would create its own specialized board to run games. 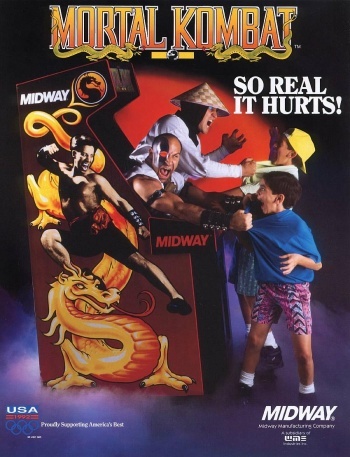 Arcade games were very popular during the 80's and 90's, and struggle to survive through the 21st century. Today, traditional arcade machines are fairly uncommon and most venues have replaced these units with redemption machines, which yielded increased profits. Like with ripping from PC games, ripping from Arcade games is on a case-by-case basis. Depending on which board the game you want to rip is, some tools will be more useful than others. WinKawaks is a emulator which plays games from the CPS1, CPS2 and MVS (Neo-Geo) Arcade boards. It also features some debug tools, useful for ripping sprites. You can download it Here. To rip sprites, you must boot up the game of your choice and play it to the point where the sprites you want are. Then, pause the emulation with the "Enter" button (not required, but recommended). NOTE: DO NOT resize or maximize the emulator window. Before you get to the ripping, choose the menu "Video > Set background color...", then set the color to something other than black (I suggest pink, since it gives a better contrast). From here, you have two methods for ripping the sprites. The pop-up window will appear above the main window, so you'll need to manually move it to someplace so you can see the main window. These three buttons allows you to enable or disable the background/HUD layers. For CPS games the three buttons will be available, while for Neo Geo games only the 8x8 button will be available. 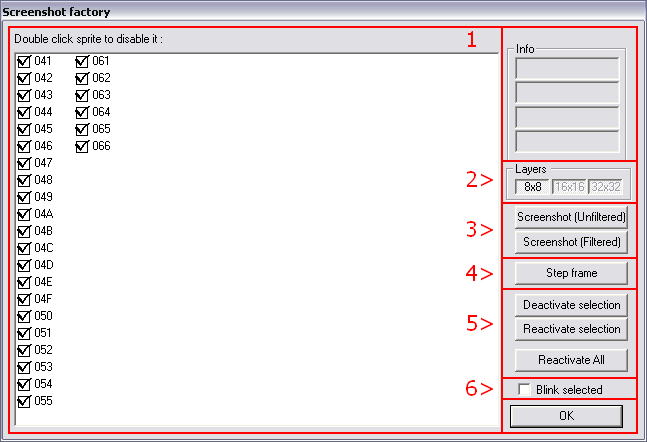 Once you select any sprites listed on the white area, you can use these buttons to enable or disable them. Checking this box will make the sprite blink on the main window once you select it in the white area. Useful for identifying which sprites are which. The Shots factory is mostly useful for ripping backgrounds and simpler animations. If you want to rip fighting game characters or those multi-layered bosses, the second method is recommended. Much like the Shots Factory, the pop-up window will appear above the main window, so move it elsewhere. The first thing you will notice is that the game screen will be replaced by the game's tiles. Once you select any of the sliders (just click them), you can use these buttons to easily scroll them without having to drag them with the mouse. This is highly recommended, especially for finding palettes. Alternatively, you can use the arrow keys on your keyboard, which is much easier than clicking the buttons continuously. NOTE: You won't be able to find the correct palettes if what you're trying to rip was not currently on the screen before you entered the Tile Viewer. In MAME, a sprite viewer can be accessed through the following sequence: Press F4 to bring up a palette viewer, and while on the palette viewer, press Enter to access the sprite viewer. Use the up and down keys to scroll through the sprites in the current graphic bank, left and right to switch palettes, [ and ] to switch graphic banks, and the R key to rotate the sprites in the viewer by 90 degrees. You can also press Enter to switch to backgrounds if you want to rip them. Because there's no way to directly save the sprites displayed in the sprite viewer, you must downsize the window to give the sprites the proper pixel-size then PrtScn the window, followed by pasting it into a graphics editor like Paint. Not all games can be ripped with this method, only if they use a tile based system and sometimes it is just the background tiles. Some arcade systems such as the Neo Geo and many Sega arcade games either don't display the palette viewer or just the palette viewer. If you prefer ripping from screenshots, frame-advance and rewind keys can be mapped to capture animations while the game is paused. F12 is the default key for screenshots, but you may have to adjust screenshot settings so the captures are clean and in the game's 1:1 pixel resolution. Despite the name, the sprite viewer was made using information from disassembling Out Run. This can rip Out Run, Super Hang-On, After Burner and some of the System 16 library. It is a command-line based tool and requires knowledge of the sprite banks that were used, they are listed as mpr and then a number at the end. The files have to be unzipped and then load 4 sprite banks at a time to view the sprites. The sprites can be saved as a BMP file. Apart from Out Run, the sprites have no palettes so they have to be recolored. Similar to WinKawaks but lacks a noticeable Tile Viewer and with a different Shot Factory.